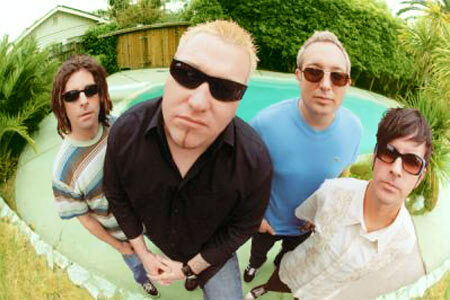 Smash Mouth Biography, Discography, Music News on 100 XR - The Net's #1 Rock Station!!! 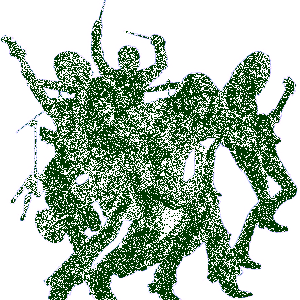 The Alternative-Rock act Smash Mouth was formed in San Jose, California USA, in 1994 when boyhood friends and former garage band compadres vocalist Steve Harwell and drummer Kevin Coleman recruited guitar player Greg Camp from a local cover band. Camp then persuaded bassist Paul De Lisle, with whom he'd played in another outfit, to take a chance on the new band. After toiling for a couple of years making an indelible mark on the local Rock scene, the quartet inked a deal with Interscope Records, which released their debut full-length CD, "Fush Yu Mang", in June 1997. The first single, "Walkin' On The Sun", climbed to the top of The Modern Rock chart and Smash Mouth supported the album with extensive touring, including jaunts with Sugar Ray, Third Eye Blind and Blur, among others and even in an off year, the group found themselves happily ensconced in the top 20 of The Billboard 200 chart; two more Modern Rock top 30 hits followed with "Why Can't We Be Friends" and "Can't Get Enough Of You Baby" sending the album to double-platinum status. Smash Mouth returned in mid-1999 with their sophomore effort, "Astro Lounge", which shot to #6 on The Billboard Top 200 Albums chart, preceded by the smash single "All Star", it climbed into the top 5 of The Billboard Hot 100 and stormed the Billboard's airplay charts peaking at #1 on Adult Top 40 and Top 40 Mainstream lists and at #2 on The Modern Rock Tracks; the second single off "Astro Lounge" was "Then The Morning Comes", it also appeared in the top 30 of The Modern Rock chart, peaked at #8 on The Billboard Hot 100 and helped the album sell nearly three and a half million copies. Following the departure of one of the band's founding members, Kevin Coleman, the group hired Michael Urbano as their permanent drummer and in the summer of 2001 Smash Mouth scored another big hit with their throbbing rendition of "I'm A Believer", a song used in the blockbuster movie "Shrek", which peaked at #25 on The Billboard Hot 100 and peaked at #4 on the Adult Top 40 Singles chart. That fall, the band released its third album, a self-titled affair that featured the aforementioned "I'm A Believer" and the minor hit "Pacific Coast Party", but the "Smash Mouth" album didn't do quite as well as its predecessor, only reaching #48 on The Billboard Top 200 chart. In August 2003 the quartet delivered their follow-up album, "Get The Picture", making a mid-chart appearance in The Billboard 200 list and the lead single, "You Are My Number One", received modest airplay on Triple-A radio stations. After much consideration, the founding members of Smash Mouth, parted ways with long time drummer Michael Urbano due to creative differences; replacing Urbano behind the kit as of March 2006 was ace drummer Jason Sutter, best known for his work with American Hi-Fi and The Rembrandts. September 2006 saw the release of Smash Mouth's fifth full-length CD, "Summer Girl"; the disc included the single "Story Of My Life".